Angler has been a recurring and hard-hitting threat for the past year. Over 350 domains related to the Angler exploit kit infrastructure were blocked only yesterday. This analysis of the Angler EK activity reveals the most vulnerable app that Angler exploits and other relevant insights that can help you enhance your protection against it. Security researchers have been actively monitoring the Angler infrastructure to identify patterns that could help vulnerable victims increase their defenses. The exploit kit has been especially active in the past 6 months, when it incorporated new malware types extremely fast. Such an example is when Angler started spreading CryptoWall 4.0 a very short while after the new ransomware type emerged. Angler caused a huge amount of drive-by attacks that forcibly fed malware – financial, data-stealing or ransomware – to thousands of computers worldwide. Victims lost data and money, were extorted and discovered how vulnerable their systems were, unfortunately when it was too late to do anything about it. Companies also suffered the consequences of Angler’s aggressive capabilities, showing a need for better patch management and proactive security. From the analysis, we saw that Angler’s favorite target is Adobe Flash Player, the main culprit for so many automated attacks against computers running Windows. This observation is consistent with other investigations into Angler, which we presented in detail when we explained the exploit kit for everyone to understand. The cyber criminals behind Angler moved dynamically through their two core techniques: domain hijacking and domain shadowing. This allowed them to constantly bring in new servers and IP addresses that could strengthen and grow their distribution network. Below, you can see a compiled a list of Angler exploit kit servers that were delivering malicious attacks against random targets at the time this article was published. The servers mentioned below host, on average, 13 malicious domains that all work as tier-1 Angler EK gateways. Of course, the sample below is just a small part of the infected servers. 1. Domains created with the purpose of delivering payloads. 2. Legitimate domains which have been hijacked and subjected to domains shadowing. 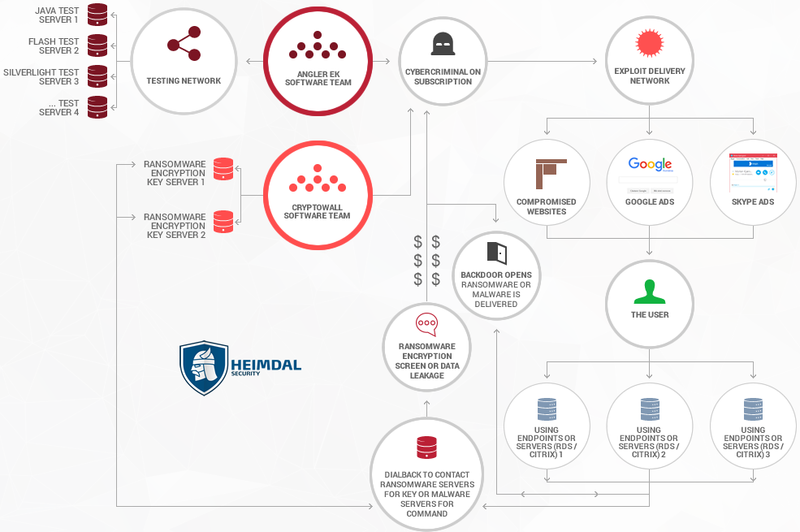 Below you can find a range of active domains from this type of Angler exploit kit servers (sanitized by Heimdal Security). Note the use of the top-level .top domains. Unfortunately, antivirus detection is generally low in this type of attack, which poses a significant threat to businesses and public institutions in Europe and beyond. We will soon publish an overview of proactive security measures that companies and public institutions can implement to protect themselves against the Angler exploit kit and the malware it spreads, so keep an eye on the blog.